A proofreader’s goal is to ensure that the material he or she is reviewing is 100% correct by finding and correcting typos, spelling errors, and other errors and inconsistencies. Proofreading 101 provides basic proofreading techniques, along with checklists, print and online reference lists, and other useful resources. Depending on the proofreader’s role, proofreading could also involve tasks such as fixing incorrect grammar and punctuation, reviewing numbers for accuracy, checking dates and figures, looking for inconsistencies, ensuring audience-appropriate spelling and terminology, checking against a house style, and fact-checking. Although these additional tasks are touched upon in this class, they will be covered in more detail in Proofreading 201. 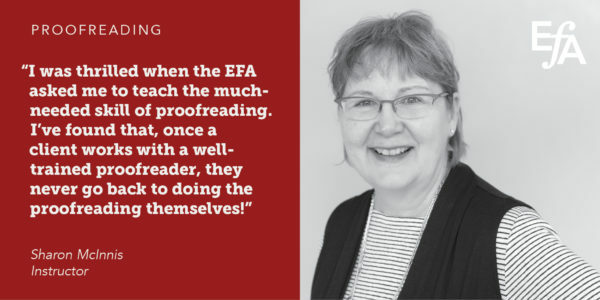 NOTE: Although light editing is occasionally required when proofreading, both of these courses focus on proofreading only; please check the EFA catalogue for editing courses. Proofreading 101 participants complete proofreading exercises each week, with detailed answer keys provided the following week. Students review the answer keys against their own work, and send questions/comments to the instructor for additional feedback. Instructor Sharon McInnis, the owner of ProofingQueen, has been providing proofreading and fact-checking services to a wide range of clients for over 18 years. Recognized by clients as expert and tenacious proofreaders, Sharon and her colleagues have reviewed thousands of files— from three-word billboards, two-page flyers and single-page ads, to 40-page consumer magazines, 100-page annual reports and 5,000-page environmental studies.